If you were at Rainbow Foods on Lake Street & Minnehaha Avenue last night around 9:30PM, you might have noticed an unusually creative and crafty customer. Artist Ben Garthus, whose Mobile Creative Outpost has been popping-up at festivals and public spaces around town over the past months, was turning a late night grocery shopping trip into an opportunity to experiment with his evolving artistic project. 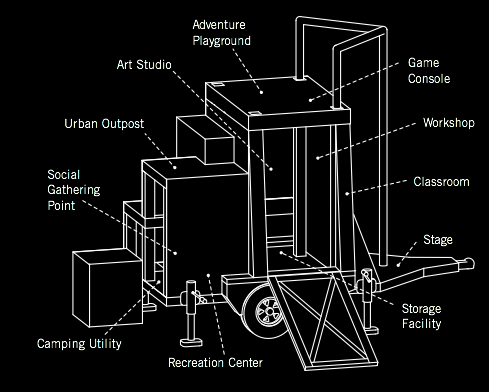 Garthus describes Mobile Creative Outpost (M-CO) as “…a nomadic social gathering point that redefines spaces into areas of creative, self-determined activity.” The project has taken the form of a wooden trailer filled with objects – odd pieces, parts, materials and tools. Garthus invites passersby to use these objects in a form of creative free play and self-expression inspired by adventure playgrounds. Children and adults have had fun inventing games and creating objects around M-CO, using the outpost as an art studio, a workshop, and a stage, among other things. This summer, Garthus is one of 8 Walker Field Office Fellows who is experimenting in public, pushing their existing artistic projects and practices in new directions, and exploring what contemporary public practice can be and do in the twin cities. Each of the 8 Field Office Fellows will be completing a small project and sharing the results during informal, public conversations inside the FlatPak house, which Walker Education & Community Programs staff are re-imagining as Field Office for the duration of Open Field. 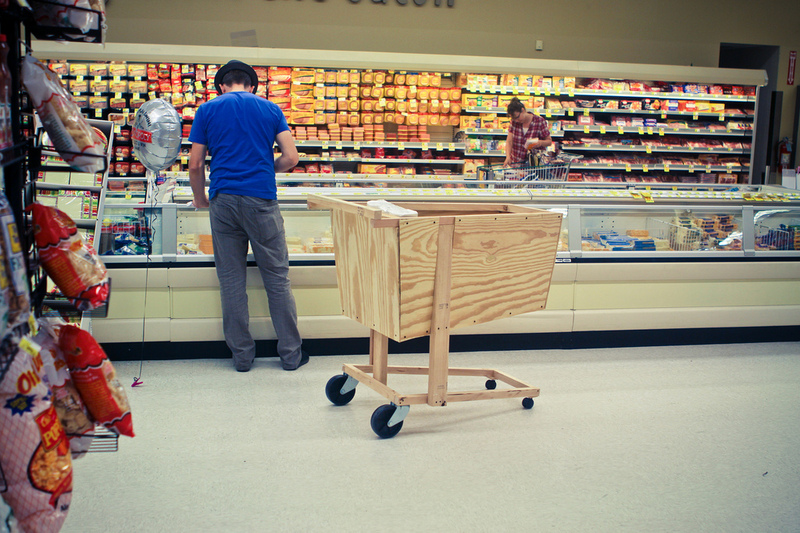 Throughout July and August, Garthus will be building and using handmade shopping carts like the one he took out for a spin at Rainbow Foods last night, turning the routine activity of purchasing food and household items into something that invites glances, questions and conversations. The cart pictured here is just the first in a series of evolving models. In the coming weeks Garthus plans to debut more elaborate, interactive carts with opportunities for strangers to interact with him and even to create or play in the prescriptive consumer environments of big box stores and shopping malls. Garthus is even considering a cart-building workshop in a parking lot, inviting shoppers to build their own carts using M-CO objects and tools. All of this serves a rather simple, but thought-provoking purpose: to encourage creativity and play in unexpected places. It will be interesting to see whether the act of shopping for groceries in private stores can be turned into an opportunity for public experiment and creative expression.